Last week my daughter Maggie wanted to create an under-the-sea-world, which in her 4-year-old mind involved making a bunch of jellyfish out of disposable bowls and crepe paper streamers. 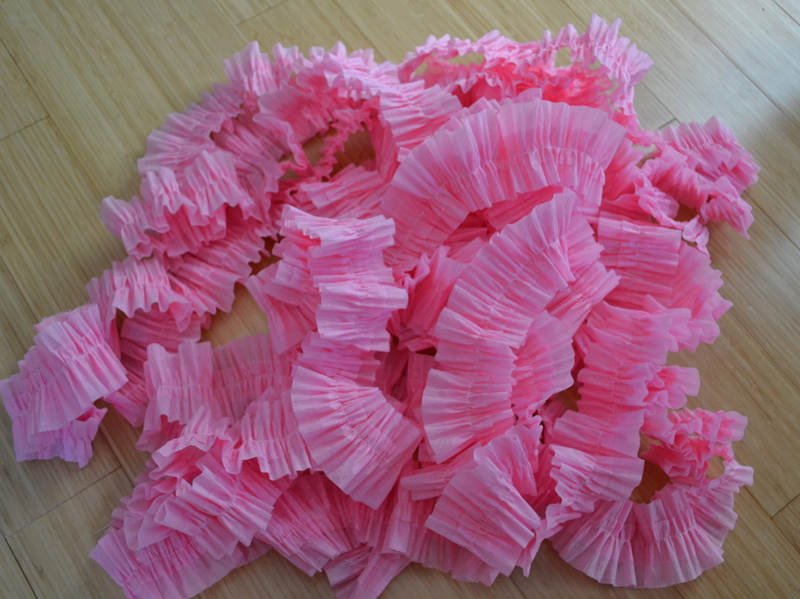 The point of my little story is that her project left me with several rolls of pink & white crepe paper streamers. I have never really been a big fan of crepe streamers as party decorations, but I didn’t really want to let them go to waste, either. 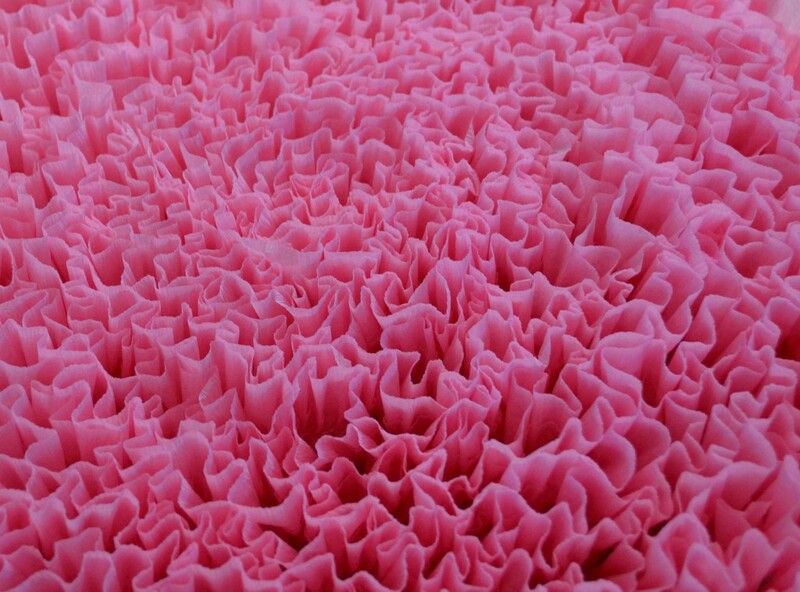 I started searching the Internet for crepe paper ideas and lo and behold, I found these and these and these, and I had an aha! moment. 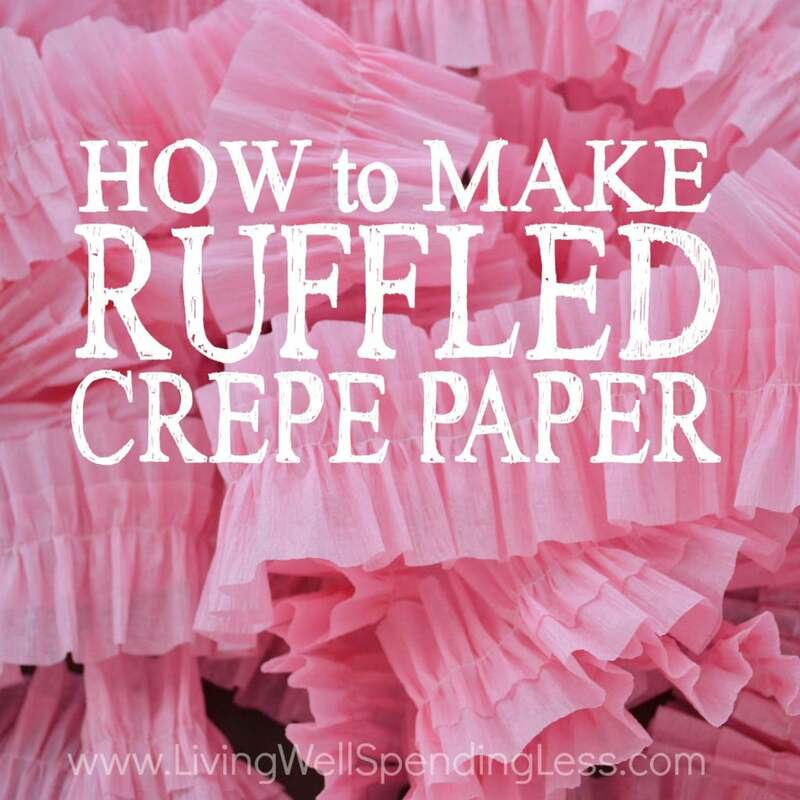 I would make ruffled crepe paper streamers for Annie’s Sweet Soda Shop party, and they would be fab-u-lous! Step 1: The crepe paper at the dollar store comes in two-packs, which is enough to make one very looooooong streamer. 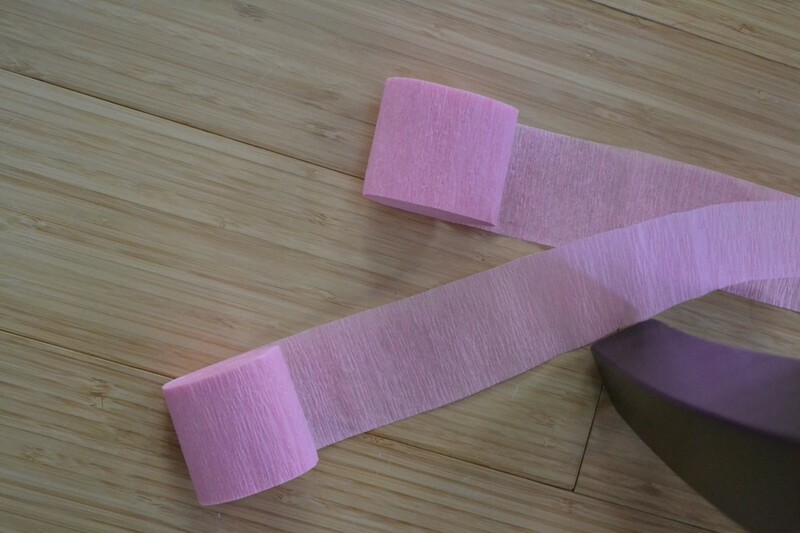 Using both rolls of crepe paper, overlap the ends as shown. Place on sewing machine & sew for a few stitches (maybe an inch or two). Do NOT backstitch! Step 2: Leaving the crepe paper pinned under the foot of the sewing machine, tie the two loose threads together before sewing further. This will keep it from unraveling. Step 3: Begin sewing in a straight line, stretching the crepe paper out fairly taut as you sew. It will automatically begin to ruffle as it goes through the machine. 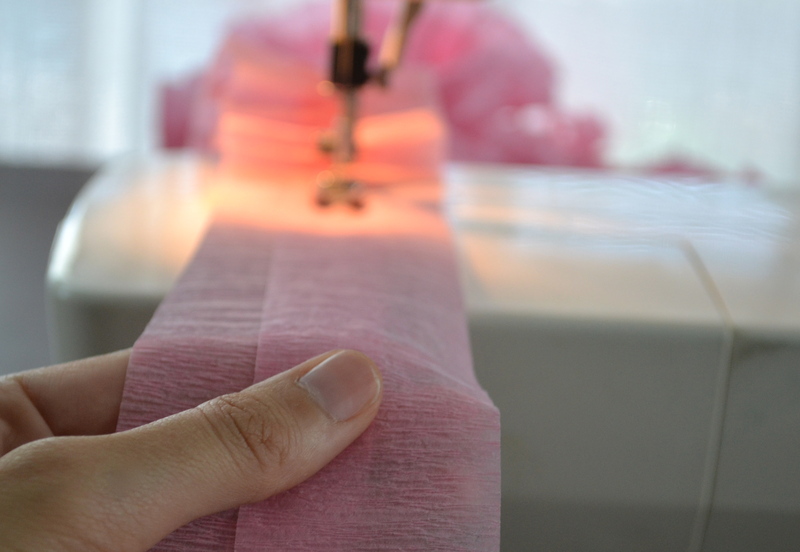 As you sew, you may have to stop periodically to spread out the ruffled streamer or untwist the yet-unruffled crepe. 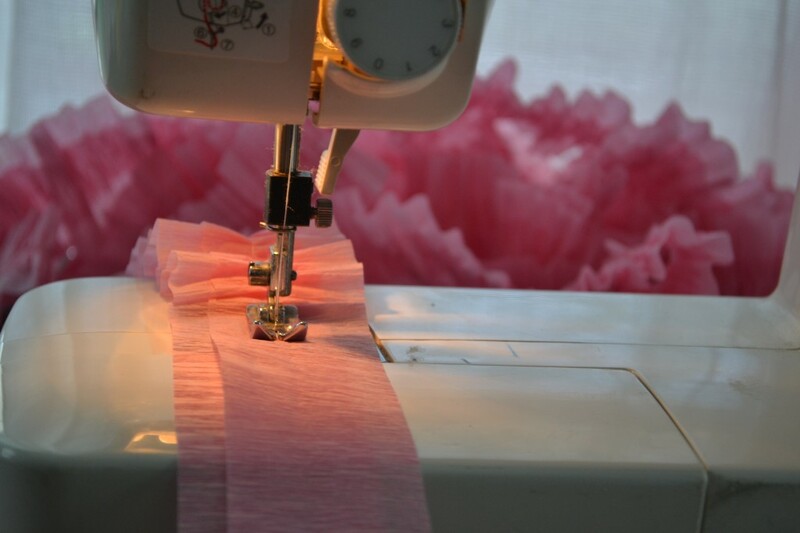 …and sewing until the entire length has been ruffled, then be sure to tie up the loose ends. 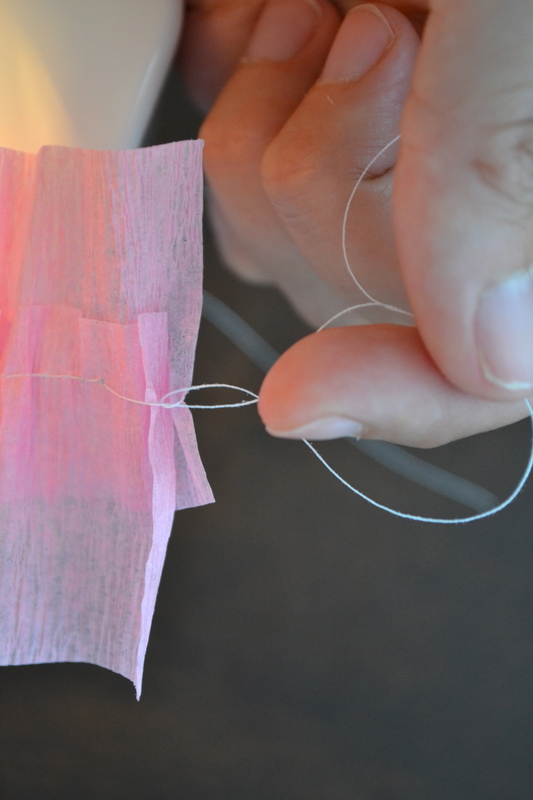 The streamer can be cut to varying lengths, just use a piece of tape to secure the loose threads after cutting. 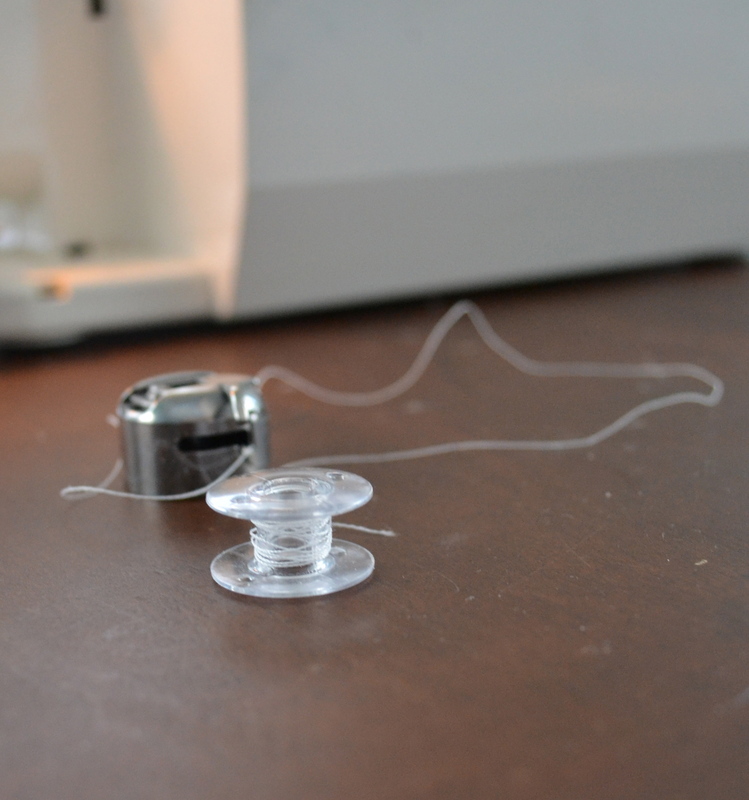 Be sure to load your bobbin with thread before starting because it will take the entire roll! I am SO excited about how it turned out. I can hardly wait to show you how I plan to use it for the party! I know it probably seems overly labor intensive but it really was very easy. One full streamer only took me about 15 minutes from start to finish. In my opinion, totally worth the effort! Love it. Thanks for all your party tips, I’m taking notes for next time I throw a party. 🙂 Hugs. I love it! I am not a huge fan of streamers either, but this is a really nice twist on them. 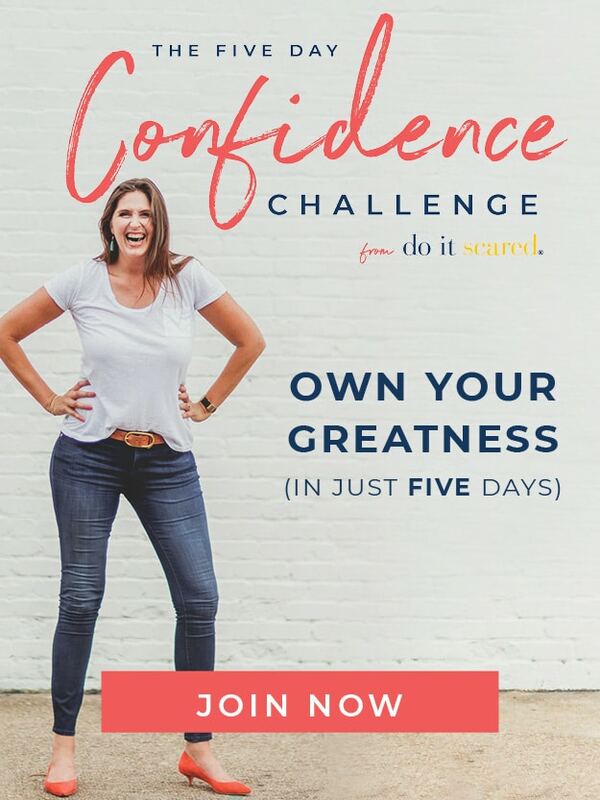 I can’t wait for an opportunity to try it out! Love, love, love! I am just learning how to sew, and this is definately going on my project list! 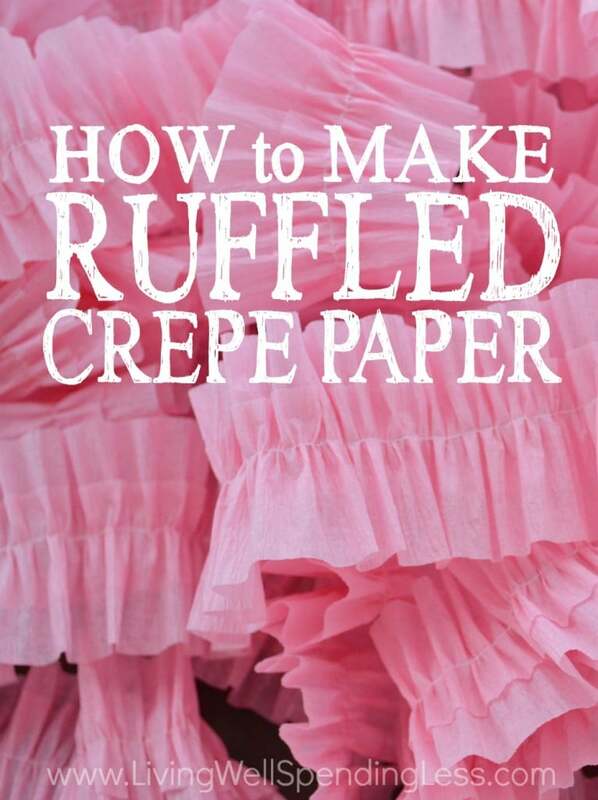 I’m trying this, but my crepe paper is NOT ruffling at all. I just have a running stitch up the middle. What’s not right? so i am having the same problem as erica in the above message and i did what ruth suggested but still had NO success!!! i am not a very good sewer and have a plain sewing machine but i have tried every length and tension in different ways and nothing has worked….seriously this is paper how hard can this really be?? I didn’t have much luck either. I could not get nice ruffles. 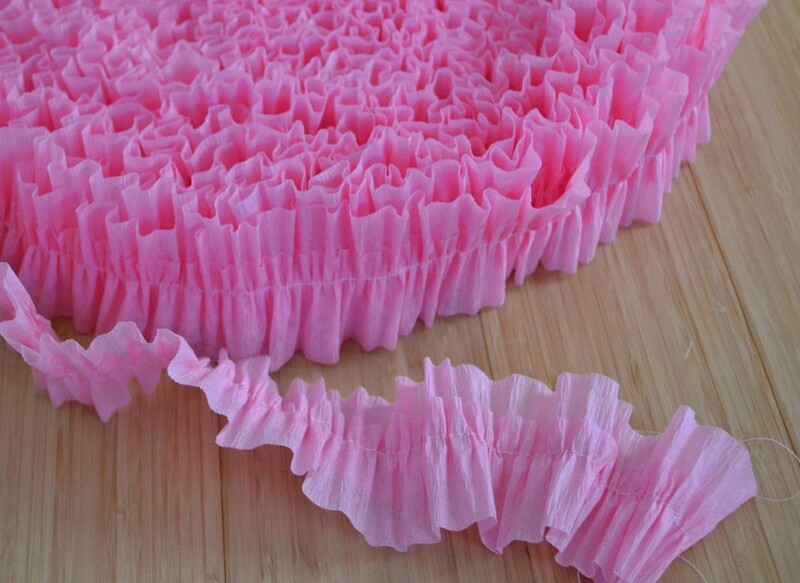 I managed to get bits of nice ruffles but not a nice long continuous stream of them. I tried different things with stitch length etc but wouldn’t call the results great by any means. I also can’t get this go work!! I’ve tried everything! 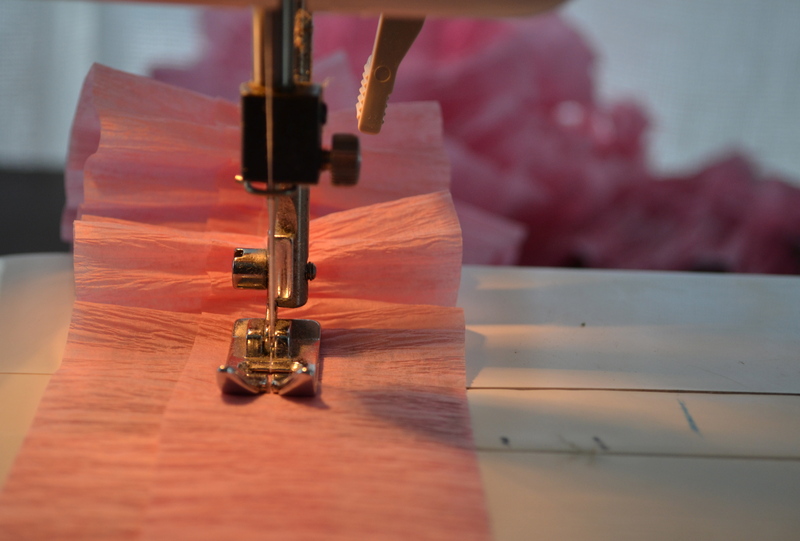 Highest tension & long stitch & also pulling it tight–I have a ton to make for Halloween party & I’m stuck! Help!! I was just searching photos of these ruffled streamers to see what others had done (I made some and use them quite frequently). I noticed that people were saying it wasn’t working. 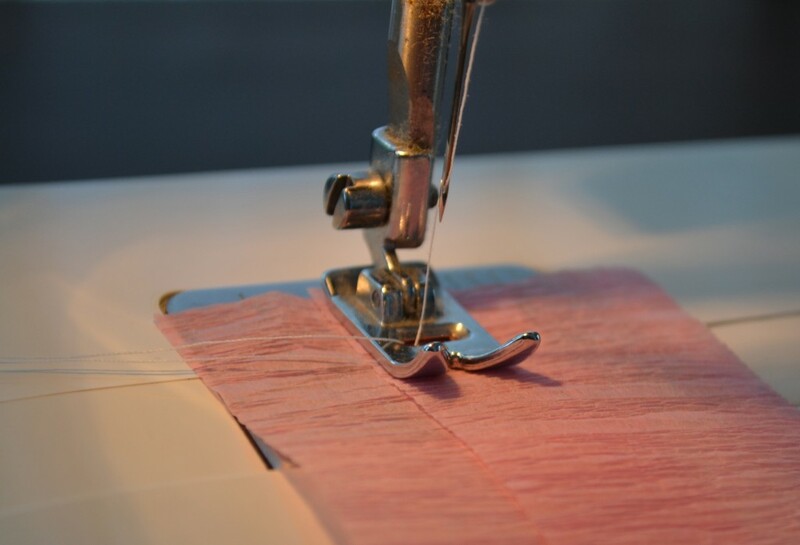 I held the spool of thread in my hand as I sewed and controlled the tension manually, since I could not get the tension right using the settings on my sewing machine. Just wanted to post that here in case people wanted to try that. Worked like a charm. Molly you are a life-saver! I was getting nothing until I tried holding the spool while sewing. It works perfectly! Thread just keeps breaking. Ugh. 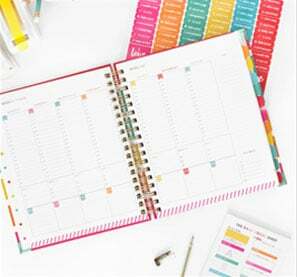 I also had no luck, but checking out your links for inspiration, I saw another method was crinkling it together. I’m kinda cramming it together before it goes under the presser foot. Used sewing machine doing trial and error!! I made my stitches longer which workcd great for the ruffles!! Thank you! !